This fleabane has yellow daisy-like flowers, an unusual color for fleabanes that are usually purple or white. There are several short and erect flowering stems two to twelve inches tall, each bearing a single head. The many narrow elongate leaves, one half to three inches long, cluster predominantly near the base of the stems, giving the plants a cushion-like appearance. 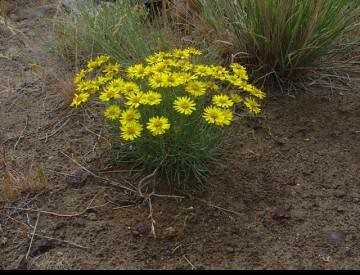 Linear-leaf daisy has adapted to complete its growth and reproduction quickly before entering into a long period of dormancy. The Okanagan-Colville Indians used a decoction of the whole plant to treat tuberculosis. They also drank a brew of this plant for general illness, backache, and cracked bones. The leaves were chewed for sore throats, or chewed up and spit on sores. Toasted leaves mixed with grease, or mashed fresh plants were used as a salve for pains, sores, swellings, and wounds.